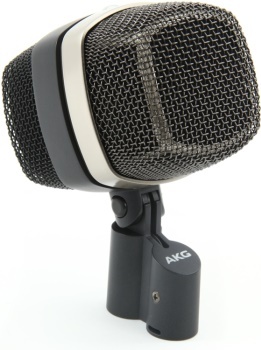 Strait Music - AKG D12VR Dynamic kick drum microphone with four different sound shapes. Home › Pro Audio & Recording › AKG D12VR Dynamic kick drum microphone with four different sound shapes. AKG D12VR Dynamic kick drum microphone with four different sound shapes. The D12 VR will work without phantom power, delivering the true sound of your bass drum. Engage phantom power, and you get three active filter settings that dramatically help you sculpt the perfect sound. Whether you're recording or running live sound, you can't go wrong with the AKG D12 VR in front of the kick drum. So whether your drummer is a Yeti with a 28" bass drum, or you're recording sound effects involving small-arms fire, the D12 VR can handle the high signal levels and it sounds great doing it.